We really hope you enjoyed yesterday's hop at There She Goes, don't forget, they are open until Saturday for commenting!! Today, we have another FABULOUS set to show you, so let's get to it!! Torico’s new set this month is well, it’s a GRAND SLAM!! America’s favorite past time has been brought to life with Torico’s fabulous style, and cutesy whimsical characters!! For the baseball enthusiast to the mom/dad yelling in the stands, this set is PERFECT for the baseball lover in your life! Can you imagine the scrapbooking possibilities! For my card, I wanted to have a little fun and used the current Sweet Sunday Sketch Challenge. I went to my LSS last week and picked up these fun Bella Blvd papers for my card - super boyish looking and perfect for this set. 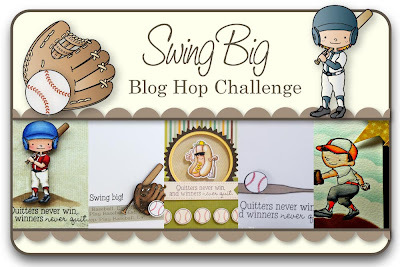 Would you like to win the new Swing Big stamp set? Here is what you need to do- visit the Trendsetter’s blogs that are participating in each of the blog hop challenges below and comment on their creations as you go. One of the Trendsetter’s blogs (from each hop day) will be randomly chosen as the ‘it’ blog and a winner will be picked using a random number generator from the comments left on that Trendsetter’s Blog Hop Challenge post. Oh my, is this ever cute! My little one has come into his own this summer with baseball! This set makes me think of him and puts a smile on my face! 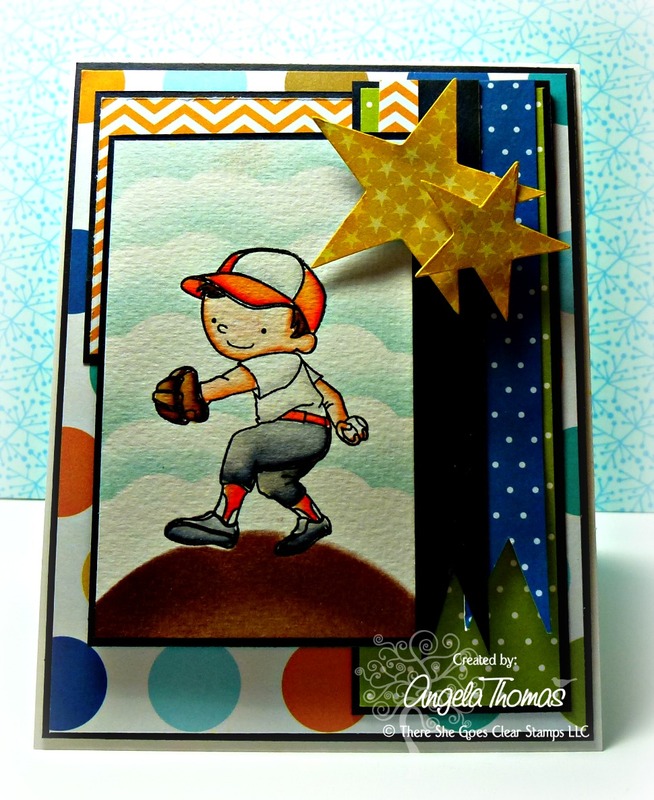 This is so adorable, love the little baseball player and the great card design and sketch. So fabulous. Super cute. Love your clouds and pitchers mound. Angela!!!!! I need this set, girlie!!! Seriously! I have a house full of boys that love baseball! Heck, even the dogs are boys! Love this card, as always! Your background is super cute. Great stamp set! Very cute card..love the clouds in the background the the bright stars. AWE very Fabulous!!! love that pitchers mound you made him standing on! Great papers too!!! How cute is this! Love the sky background! What a beautiful scene you created with the pitcher on the mound. Gorgeous coloring. Gorgeous colouring - you've done wonders with this sweetie! Love this set and I think I might just have to grab me a set for my son's cards:) Super cute card, the coloring is fabulous! your card is great... the clouds are great! Very cute card! Such a perfect image for a little boys card! Fabulous--I like all the colorful papers and your coloring. Great card - your coloring is awesome. Soooo cute! I love the background you made too! love all the layers...great colors! Love the layering on your card. 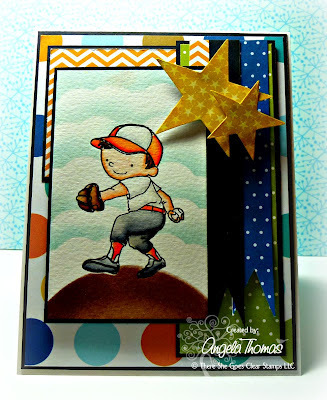 The colours and those stars pop out for a real eye catching All-Star card! Gorgeous card.. Love all the colors the paper.. Awesome coloring job!